What are the government job opportunities for B.Ed students? With the government of India laying a more significant amount of emphasis on the educational sector of India, the time has come for the B.Ed. Qualified students to prosper. Moreover, it is also a widely accepted fact those in recent years, many government institutions have come up with the sole aim to disperse quality knowledge. So, as a B.Ed. The student you stand the chance of contributing to the development of your country. On the other hand, the job vacancies related to B.Ed. are quite prestigious and high paying. Hence, if you are someone who is pursuing a B.Ed. Course, be prepared to get yourself enrolled in the screening process. By doing so, you would not only get a high paying job but would also avail job security and satisfaction. This profession is also ideal for those students who are always up for embracing newer forms of challenges. It is so because of a lot of B.Ed. Job opportunities are exclusively reserved for remote areas. M.ED Pass Jobs. When compared to the yesteryears, the current educational industry of India is witnessing promising growth. This can be attributed to the fact that a lot of government institutions in recent past is trying hard to educate those people who reside in the remotest corners of the nation. In this context, it is important to note that as per the latest census, the educational sector of India has registered massive growth. Literacy rates have improved, and as a result, the living conditions of the poor and deprived have improved a lot nowadays. Thus, you can see that a lot of students are pursuing B.Ed. Course to secure top job positions in the prestigious Indian schools and colleges. As a B.Ed. Student, you have the option to acquire top jobs in various institutions of repute. A lot of government colleges are also actively recruiting B.Ed. Passed candidates in city schools and colleges. Apart from schools and colleges, you can even get the chance to land a top job in the educational boards set up the government. However, in that case, you have to be literate in computers. With the increasing use of educational resources among the poor masses, the government of India is making sure that the poor and deprived are getting the quality education. 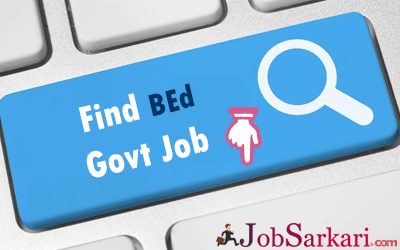 Here is the list of government jobs for B.Ed. Students. It is that kind of a government job opportunity for B.Ed. Qualified students with the help of which they can have a prestigious job role and great perks. However, you have to be computer literate. The demand for teachers would always be there in the future and hence it is essential for B.Ed. Students to get into this kind of job role. This job role also offers high pay scales and a prestigious career. In order to assess and maintain the quality of schools, the government would continue to appoint school inspectors. As a B.Ed. qualified students, you can apply for this kind of job roles.